The crew at One Laptop per Child have posted a bunch more great videos on there very own YouTube channel. Watch the videos and then give them money. The crew over at the CommonCraft Show have put up another phenomenal video, “Blogs in Plain English.” If you have friend or co-worker who doesn’t understand what the big deal is with this blogging stuff, this is a GREAT video to show them. Zipcar has a Great Mobile Web Site! While the mobile Web in the USA has a long way to come, there are some shining examples of what it can be. Car sharing and hourly rental service Zipcar has one of the best mobile Web site’s I’ve seen. My whole family was in town last weekend. We were out and about and thought it might be fun to get a Zipcar to do some more shopping. The thing is… I wasn’t near my computer or my apartment for that matter. All I had was my mobile phone. 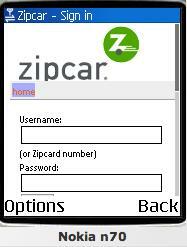 I typed “zipcar.com” into Pocket Internet Explorer on my Samsung Blackjack. It auto-detected that I was surfing from my mobile phone and gave me the mobile Web site. I was quickly able to see if there was or wasn’t any cars available. It was so handy. It was quick and easy. Not only is it useful but it makes me more happy with Zipcar as a company. It makes me think they understand me as a customer. They understand that we live mobile lives. We don’t just need a car when we’re at home and in front of our computers. If you plug Zipcar’s mobile Web site into dotMobi’s evaluation tool ready.mobi , you can see that Zipcar has followed industry standards. It scored a 5 out of 5. This is the kind of site that is going to people in the USA excited about the mobile Web. Posted on December 1, 2007 Categories Mobile, Web, Zipcar1 Comment on Zipcar has a Great Mobile Web Site!